When is a hit song not a single? It happens all the time these days - for example, when album tracks flood the singles chart upon the release of a new album. But, in 1985, one of the biggest hits of the year was actually the B-side of the extended version of another song. 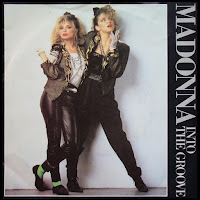 Yep, this week in 1985, Madonna was so massive she didn't even have to issue "Into The Groove" as a 7" single for it to make short work of its journey to the top of the charts in Australia. At the top of the ARIA singles chart this week in 1985, "We Are The World" spent its ninth and final week at number 1 - making it the longest-running chart-topper since "Mull Of Kintyre/Girls' School" by Wings, which ruled the roost for 11 weeks in 1977/78. Meanwhile, another enduring single spent its final week in the Australian top 50. Bruce Springsteen's "Dancing In The Dark/Pink Cadillac" registered its 53rd week on the chart - which, together with an additional 11 weeks spent between numbers 50 and 100, equalled the top 100 chart run of "Chariots Of Fire" by Vangelis in 1981/82, although that movie theme only spent 35 of its 64 weeks in the top 50. In the pre-download era, when it wasn't so easy to amass "Riptide"-like numbers of weeks on the chart, Bruce's top 50 tally was an impressive feat. "The Heat Is On" and "Neutron Dance" had hit the top 10 - and one more song from Beverly Hills Cop would do so - but there was no such luck for this track from the soundtrack, performed by the singer behind the original version of "Lady Marmalade". Taken from the first album by the Belfast band whose 1988 single "Broken Land" became a minor top 50 hit, "Send My Heart" was used in the soundtrack to Italian horror film Demons, although the scenes in the music video don't look that scary. To me, it's one of their best known songs but this title track from the debut album by the British sophisti-pop group (the lead singer's name was Mark) was a flop at home, while all four other singles from the LP reaching the UK top 50. One last hurrah for Redgum with its original trio of John Schumann, Michael Atkinson and Verity Truman intact, before the former member went off on a solo career. "The Drover's Dog" was found on the Australian folk rock group's first best of album, Everything's Legal, Anything Goes - Redgum's Greatest, and became their third and final top 20 hit (following 1983's chart-topper "I Was Only Nineteen" and "I've Been To Bali Too", which made number 16 in 1984). As you'd expect with Redgum, "The Drover's Dog" had a political bent - the lyrics were a version of Bob Hawke's life story set to the melody of "When I Was A Lad" from HMS Pinafore, with the title taken from a quote made by former Labor leader Bill Hayden about Hawke that "a drover's dog could lead the Labor Party to victory". After releasing my favourite ever single of theirs ("You're So Strong"), Mental As Anything proved as unreliable as ever in my books by following it up with one of my least favourite songs from them. Of course, "Live It Up", the second single from Fundamental, was a runaway smash and became the kooky band's biggest ever hit, but I found it too nursery rhyme-like - if you can have a nursery rhyme about going back to someone's place (hey, "Ring A Ring O' Roses" was said to be about dying from the Great Plague, so why not?). The song even broke into the UK charts (reaching number 3) a couple of years later after it was featured on the soundtrack to Crocodile Dundee. Having run out of singles to lift from debut album Alf, Alison Moyet released this cover of a Billie Holiday B-side from 1945. In the UK, it became far and away her biggest hit to date, reaching number 2 and equalling the peak attained by Yazoo's "Only You". Australia wasn't so taken with her interpretation of the jazz standard, and it progressed no further. Alison would be back with a new pop album in 1986 - and repeated the trick of releasing a remake of a classic song between her second and third albums, but 1987's "Love Letters", while making number 4 in the UK, didn't register on the ARIA top 100. While I can't stand "Live It Up", here's another polarising top 5 single I am in favour of. Despite the fact that it's been completely overplayed in the past three decades and rubs some people up the wrong way, I still like "Walking On Sunshine" and the fact that it never fails to put a bounce in my step. One of the most exuberant songs of all time, it actually started out in a slightly different form on Katrina & The Waves' debut album of the same name in 1983. Two years on and the band were the proud owners of a major label record deal - and "Walking On Sunshine" was, like the majority of the tracks on the band's self-titled album, given a bit of a polish up. The revamp worked a treat, as the song hit top 10s around the world - and would prove impossible to better. Katrina & The Waves are often wrongly accredited as having only had one hit in Australia, but here's an artist who is a genuine one-hit wonder: British musician Paul Hardcastle, whose UK number 1, "19", was also unique in being one of the first chart hits to make extensive use of sampling. 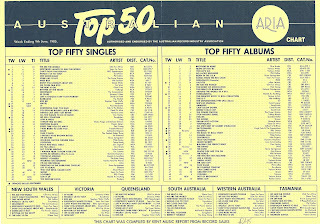 Like the aforementioned Redgum chart-topper, "I Was Only Nineteen", the title of "19" refers to the average age of soldiers in the Vietnam War - well, that was the statistic given by a documentary that inspired Paul to record the song, with snippets of its commentary interspersed with clips from news coverage and electronic beats. The release of the record coincided with the 10-year anniversary of the conclusion of the Vietnam War, but despite a decade having passed, the conflict was still incredibly contentious, particularly in the US, where radio airplay for the track was limited. Even so, sales of the single in America and all around the world were massive, so much so that Paul's then-manager was able to keep his fledgling business afloat. That company was 19 Entertainment and Paul's manager was Simon Fuller, making "19" responsible for Spice Girls, S Club 7 and Pop Idol. "Material Girl" had spent its 12th and final week on the top 50 seven days earlier, but as we'll see as 1985 progresses, Madonna had no shortage of singles up her sleeve - including the third release from Like A Virgin, "Angel", which leapt into the top 20 (from an entry position of number 99) on its way to number 1. It didn't get double A-side billing on the ARIA chart for another three weeks, but a key component of the success of "Angel" was the song tucked away on the B-side of the 12" version - a little track you might have heard of called "Into The Groove". As good a song as "Angel" is, "Into The Groove" is not only one of Madonna's all-time best records, but at this point in time was a never-before-released track from the world's hottest female artist. It was also taken from the soundtrack to Desperately Seeking Susan, in which the singer made her feature film debut as an actress. In short: the single sold so well because of "Into The Groove". The double A-side status of the single in Australia mirrors the decision to give joint credit to "Vogue/Keep It Together" five years later, and it meant that "Into The Groove" was able to rank as one of Madonna's 11 (to date) chart-toppers - even if it had to share that honour. In the US, however, chart rules meant that "Into The Groove" was ineligible to register at all on the Billboard Hot 100, while "Angel" reached a peak on number 5 on its own - which is not bad going given it didn't even have a music video. Meanwhile, over in the UK, "Into The Groove" was released as a stand-alone single and it duly reached number 1, with a re-release of "Holiday" coming in at number 2 behind it during its reign at the top. By the time the combined might of "Angel" and "Into The Groove" had made it to number 1 in Australia, Madonna had yet another song debut in the top 20... but we'll get to that in a few weeks. Next week: they may have been off doing different things, but the five members of one of the world's biggest bands still managed to reunite for a massive soundtrack hit. 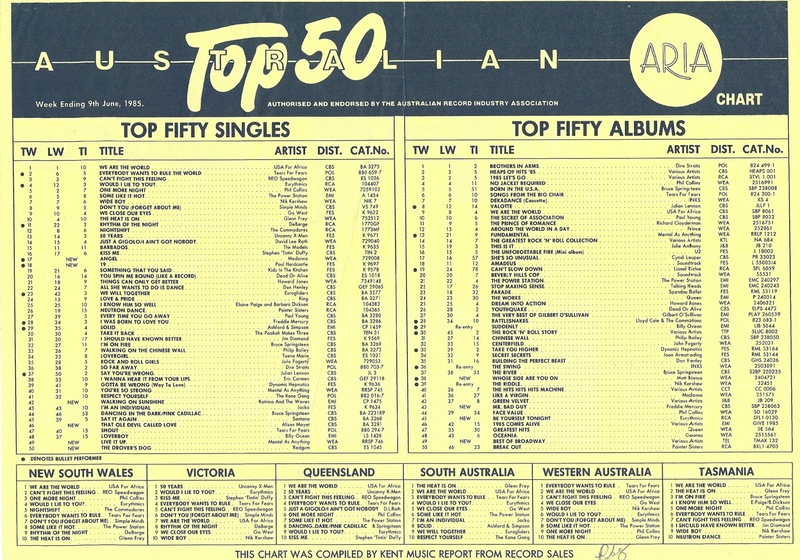 Plus, the top 50 welcomes a LGBTQI triple play (decades before that acronym even existed). I'm surprised the local record company didn't delete 'Dancing In the Dark' earlier in its chart run; but I guess enough people were buying the accompanying album for them not to feel a need to (if record companies were in the habit of doing such things back then). I didn't hear 'Send My Heart' until 2012, when someone (with similar musical tastes to me) in the UK on a pop forum I visited posted a thread about the track. I like it a lot. Never heard the Redgum track, but it doesn't sound like a chart 'song' at all. I liked 'Live It Up' at the time, but it's the kind of song that really grates with time. Didn't know the Alison Moyet track other than by title, and don't care for it. I like 'Walking On Sunshine', but it has been overplayed. I mentally associate it with Kerri-Anne Kennerley's midday show from the 90s for some reason. I must've caught her performing (or dancing to the band play it) once when channel-flicking. It has that 'get up out of your seats!' vibe. Quite a mixed bunch of entries this week, with several 'obscure' (for someone who wasn't following the charts then) tracks. I didn't know '19' at the time either, and am surprised it reached the top 10 here. I suspect commercial radio wouldn't have touched it (even without its subject matter), which is probably why I didn't hear it then. Oh dear at profits from the song being partly responsible for karaoke TV a decade and a half later. It was a strange move that no proper video for 'Angel' was filmed. Madonna seemed inescapable in 1985 and for a few years to come. It's therefore surprising that her first real backlash didn't happen for another 5-7 years. I'm the opposite way around for Live It Up (not my favourite Mentals song but charming enough) and Walking On Sunshine (overplayed). I don't even remember how Angel goes, but Into The Groove remains one of my favourite Madge tracks and another year-defining hit. Funny Redgum should be hitting the charts at the same time as Paul Hardcastle, both bands having released songs about the Vietnam War well before that war fell back into the spotlight a couple of years later. '19' is the earliest song I know of that used samples the way it did, quite groundbreaking in that regard.